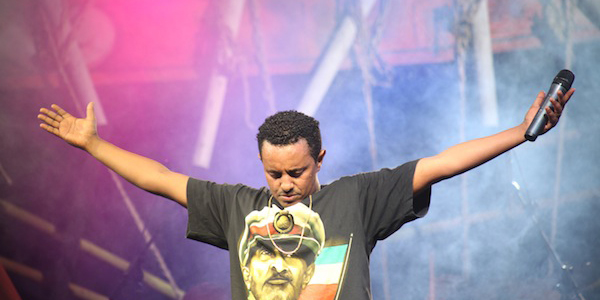 Tewodros Kassahun, better known by his stage name Teddy Afro, is an iconic Ethiopian pop star who has dominated the Ethiopian music scene for more than a decade. Teddy sings about topics of reconciliation, unity, history, justice and equality, and for political change. These subjects have gained him the hearts and ears of millions of adoring fans. Teddy is the number one voice in Ethiopia, breaking records for album sales and show attendance. He is known far and wide, inside and out of Ethiopia, as the rising star of East Africa. Teddy was born in the Kuas Meda area of Addis Ababa, on July 14, 1976. His late father, Kassahun Germamo, was a renowned Ethiopian songwriter and his mother, Tilaye Arage, was a professional dancer. Although Teddy's father had great concerns about his son entering the music world, Teddy trusted his own instincts. He saw himself doing nothing but singing as a career. He is arguably the single most popular pop-star Ethiopia has produced in many years. Teddy's tribute song to his late father is aptly titled 'Music - My Life'. Using reggae rhythms combined with the traditional sounds of Ethiopian music, he sings primarily in Amharic, which is one of Ethiopia's many languages - Influenced by Ethiopian Maestro Tilahun Gessesse and international reggae artist Bob Marley, Teddy combines the musicianship and message of his mentors. Teddy's 2001 debut release of Abugida was a landmark recording that established him as a musical power to be reckoned with. 'Abugida' means 'beginning', in the language of Ge'ez (the predecessor to the modern spoken language of Amharic). It marked his entrance onto the national stage. In May 2017, Teddy Afro released his latest studio album entitled Ethiopia which broke sales records. On the date of its release. 600,000 CDs were sold, making it the highest selling album of all times in Ethiopia. The online sale of the album was also something that has never been seen in the Ethiopian music industry. In the first week of its release, the album was on top of Billboard's World Music Chart. On Ethiopia, Teddy sings not only in his native Amharic language, he also incorporates other languages of Ethiopia, such as Afan Oromo, Tigrigna, Kunama and Sidamigna, as an affirmation of his commitment to a united yet diverse Ethiopia. Teddy is married to Amleset Muchi, a model, film writer and actress. Amleset Muchie is the former Miss Ethiopia, who was born in Gonder and raised in Asemera and Addis Ababa. She stars in a number of Ethiopian films. The pair has two children. SNWMF 25 is honored to present Teddy Afro to you.